Nothing’s harder than selecting the best of these glamour shots for our Monday postings. 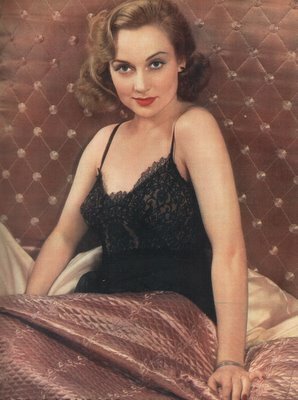 For Carole Lombard, I wanted to include a few striking pre-code images along with the later stuff, so here she is in some early 30’s publicity poses. 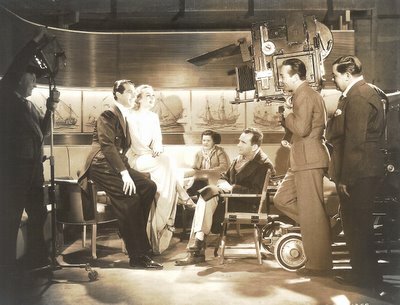 That set grouping is for The Princess Comes Across, a 1936 comedy with Fred MacMurray, seen with her here. I assume that's director William K. Howard in the chair, although there's no caption to confirm it. I couldn’t resist one of those gorgeous rotogravures (the one on the bed) from a typical Sunday newspaper section of the day. Each week, subscribers could depend on at least one beautiful color image of a favorite star. Fortunately, a lot of readers saved them. Finally, there’s a color image from a Paramount exhibitor’s annual heralding the 1934-35 season, wherein Carole was announced for another teaming with Gary Cooper in Twenty Hours By Air, an intriguing project for the two which was subsequently cancelled. More Carol glamour shots please!!! Paramount apparently downsized TWENTY HOURS BY AIR into THIRTEEN HOURS BY AIR in 1936, which starred Joan Bennett and Fred MacMurray. Fascinating stuff about Lombard's crash site, though!